We have some down time until our next competition. In a change of pace, someone cooked for us instead of us cooking for friends or the judges. 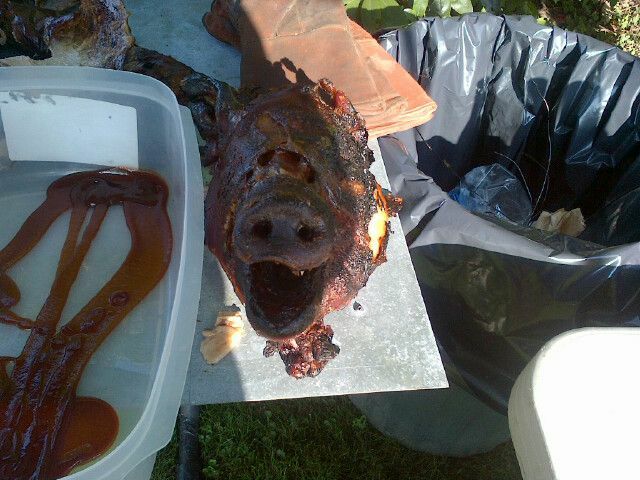 Yesterday, we were invited to an old fashioned pig roast. The above cooker has been in action for over 20 years I am told. Is is constructed of your basic home heating oil tank, cut long ways with hinges placed on the back to form the lid. Wheels were added to one side to allow for ease of moving. Notches were also cut in the lid to accommodate the spit and motor for turning the guest of honor. There are two pans that run along the bottom of the cooker on each side that hold charcoal for cooking. It is a simple, effective design for sure. 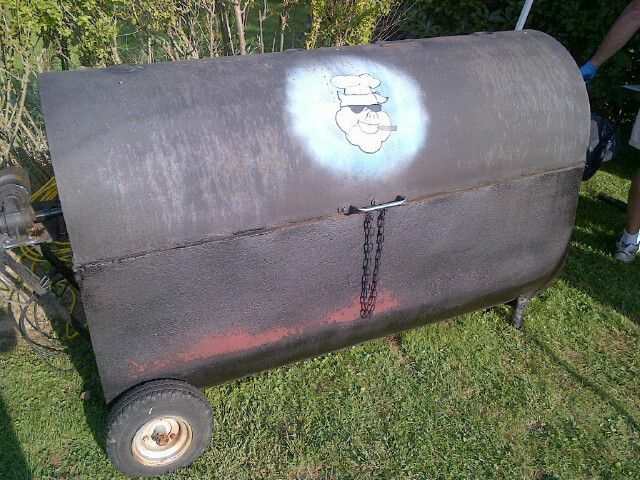 I think I might have to look for an empty metal tank to add to our BBQ arsenal. 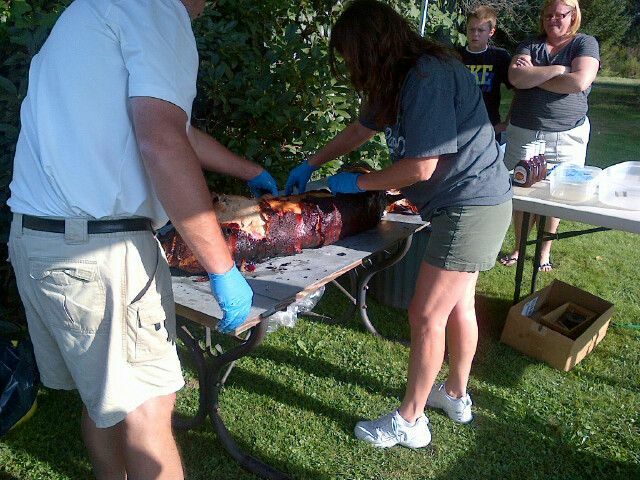 Today's guest of honor was a pig, that after dressing, was 75 lb. This specimen of pork perfection took about 8 hours to come to 170 F internal temperature. As you can see, the skin was a perfect crispy golden brown. I could not wait to start sealing pieces off of this beautiful looking hog. Hope volunteered to help our gracious host, Jimmy, pull the meat from the pig for the starving guests. 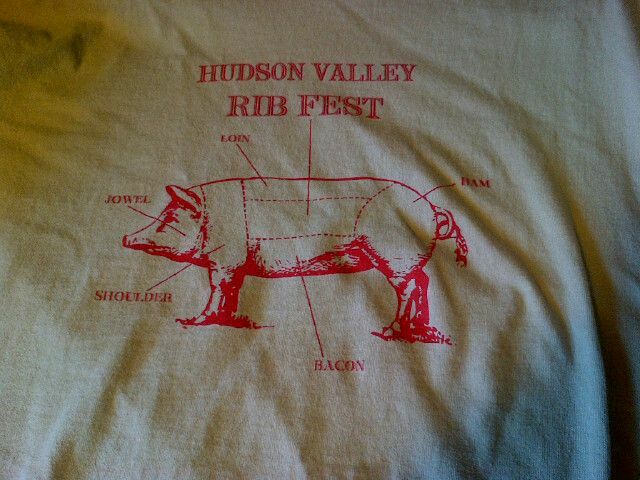 Fortunately, I was wearing a t-shirt that was quite instructional for our pig pulling duo. 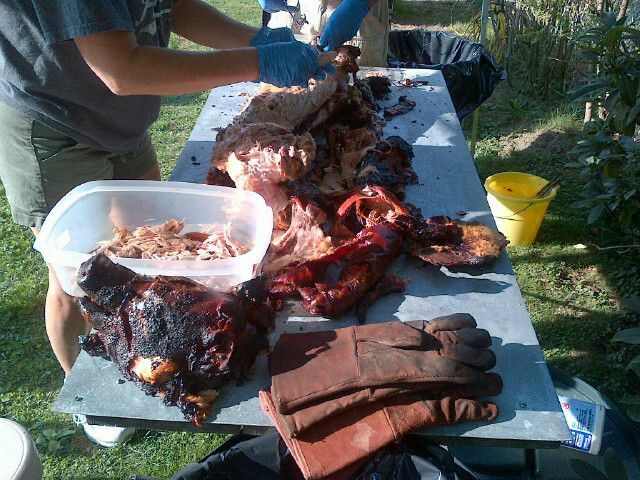 The head was removed and a pork pulling frenzy broke out. 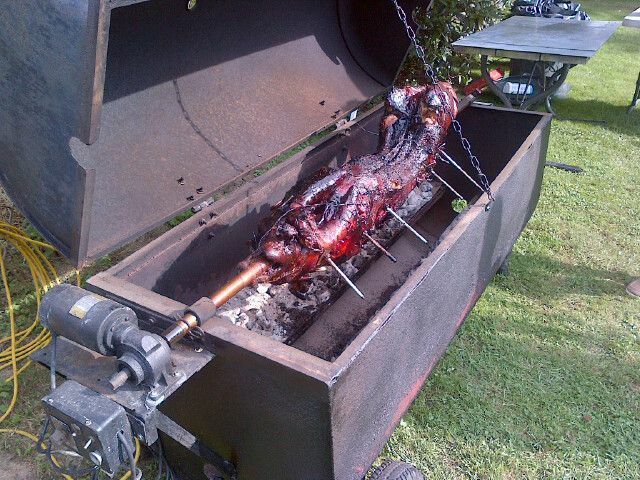 This pig was liberally injected with a creole honey butter for added flavor and to ensure a moist, tender end product. Hope was happy to report that there was not one piece of this pork that was dry. I sampled from various parts of the hog and as advertised, the jowl meat was the most tender. I also liked the crispy strands that came from the belly area of the hog. The meat was placed in containers and lightly sauced with Sweet Baby Rays. This was some of the best pork I have ever had. We just might try one at home. That is one fancy cooker with its rotisserie. I like the skin and even tried the tale on a dare. I thought about going after the tail. What was it like?